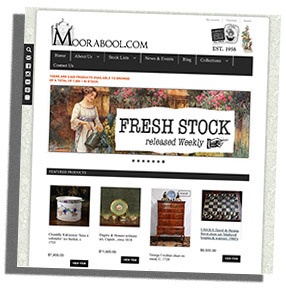 Welcome to the all-new Moorabool Antiques home on the web. We have been busily preparing since the start of the year, and are pleased to introduce our new site. It’s been designed to make browsing our immense stock a pleasure for you, our online customers. Right from the front page, you’ll find lots of different experiences – but hopefully familiar to regular visitors from our last site…. only Better and Easier! We now have a logical menu populated with all the different groups of stock, allowing you to find your are of interest and see what we have to offer. A new ‘search’ method is in place, far superior to the previous site, and you can access this on any page. Search for your interest and you will bring up pages on that subject to browse. The final way to browse is via our ‘Collections’. 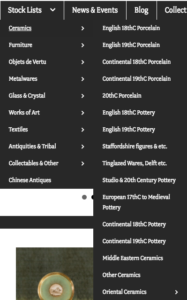 These are ever changing and developing, and involve us defining a topic – for example ‘Middle Eastern Antiques’ – and grouping related pieces into a Collection Gallery. You’ll find access to this via the menu ‘Collections’ at the top of each page. The other major addition is our ‘blog’. 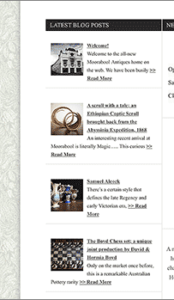 The currently featured blogs will appear down the left side of our homepage, and also on their own archive page. These are in-depth discussions of pieces or topics, and feature superior illustrations of their subject. A series of new Customer Features will appear over the next while. make a list while browsing, and is great for comparing items side by side. As you add items, the will appear to the right in a list, along with a button ‘Compare’. Click this and you will bring up all the details and pics of the items you have ‘shortlisted’, side by side. If you’re wanting to save items, there’s a ‘wishlist’. These save to an account you make – we strongly recommend making an account, which will save your wishlist and your shipping details for any purchases. It will also keep track of these for you! Drop in to our site and have an explore. There’s an ‘enquiry’ button on each page, and please feel free to send a message. As it is a new setup, if something doesn’t quite work or seem right…. let us know!